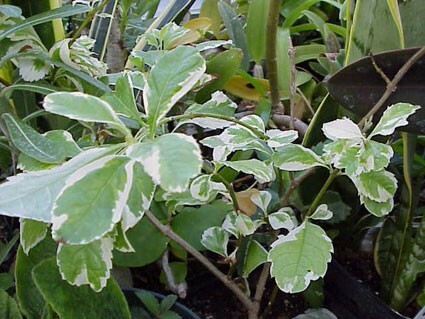 "Variegated Skyflower" Serrated glossy small leaves splashed white--when grown in full sun the foliage may emerge ivory white, gradually fading with maturity. 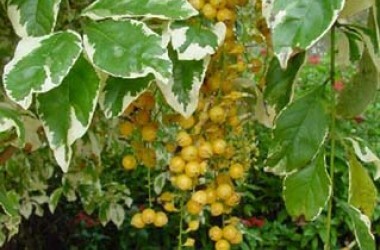 China blue flowers, if pollinated, are followed by bright "Pigeon Berry" fruit. 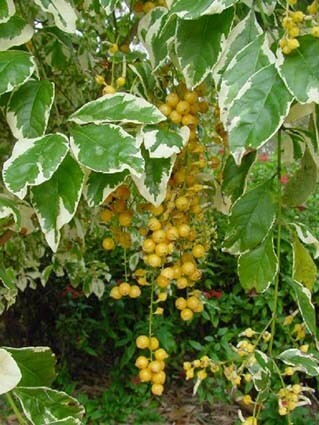 The distinctive variegation (which is a speckling, not a solid margin) may disappear in constantly warmer climates. Nonetheless, the small leaves and twiggy nature of this clone combine to maintain it the favorite of tropical bonsai enthusiasts.